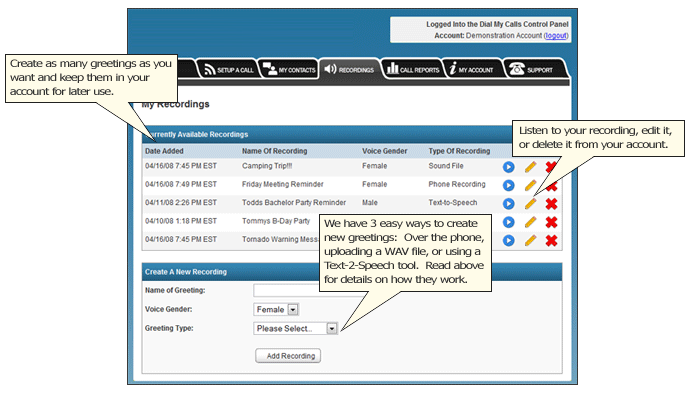 Below are shots from our web-based control panel showing how user friendly & easy to use AutomatedCalls.com is. Remember you can sign up for your free account and try out the system yourself absolutely free. If you'd like one of our customer support people to walk you through the system or if you have other questions please call us at 1-888-550-3021. Setup Your Automated Call In 3 Easy Steps! The image below displays the 3 steps it takes to setup an automated call. First, you'll select the phone numbers or groups of phone numbers you wish to call. Next, you 'll select the recording you wish to send out to those phone numbers. Lastly, you'll pick the time & date to send your call out along with any additional call options. 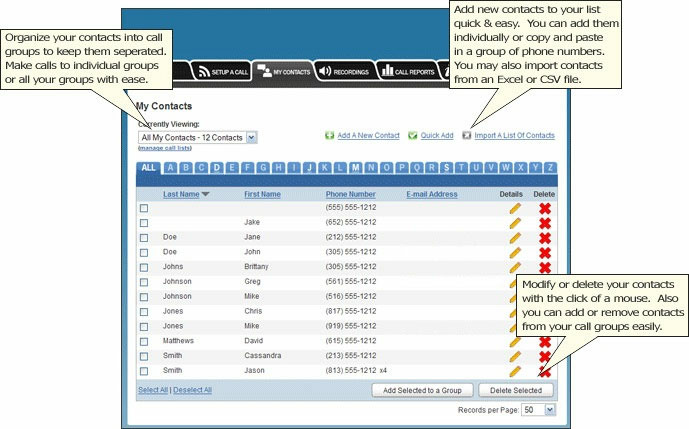 Our contact management system allows you to easily import, add and modify all of the phone numbers you wish to call. Our call groups offer you an easy way to keep groups of phone numbers separated for future use and allow you to easily send a message to a specific group of people. Your contacts are stored in your own personal control panel so you can rest assured your private data is safe & secure. Record Using A Touch-tone Phone Our phone recording system allows you to easily record a message over any touch-tone phone. You simply put in the number of a nearby phone and our automated system will call you instantly and you'll be prompted to record your message. Your message will then be saved to your account for later use. We also offer an inbound toll-free system that lets you or anyone else call into a toll free number, enter your account information and record a message which will then be stored in your account. Uploading A WAV or MP3 File With the file upload method you can easily upload any WAV or MP3 file into your account. This is great for people who want to record messages using their computer or have professionally recorded messages created. Text-to-Speech Message Creation Tool Using the Text To Speech tool you can type in your message and our system will create an audio file that speaks the message in a computerized voice. Our detailed call reporting gives you a complete breakdown of what happened on every individual phone call of your automated call blasts. This is an extremely valuable feature that tells you if your call went to voice mail, was answered by a live person, busy, an invalid phone number and for how long every call was actually connected. These reports give you a visual representation of the call and you're also able to download a database file for storage on your own personal computer. Automated Calls Is Completely Free To Use! Try It Out For Right Now! Click the above link to create your account and start sending out calls in minutes.